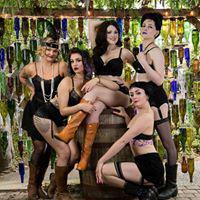 Are all of you ready for a night of Lush Bourbon and Burlesque? LULU and the LUSHES are back to give you a brand spankin' new show you won't forget! VIP tickets available online only, limited seating , which includes “The Bourbon Experience” (full tasting and introductory class) starting at 7pm, and the full burlesque show, starting at 8pm. General admission will be available for your convenience at the door which is for the show only (8pm) Arrive early as general admission tickets will sell out fast!